, son of the preceding, was born at Heidelberg in 1589, and received the first elements of his education at Leyden, apparently with a view to letters; but upon the death of his father in 1602, resolving to go into the army in the service of the prince of Orange, he applied himself particularly to such branches of the mathematics as are necessary to make a figure in the military life. 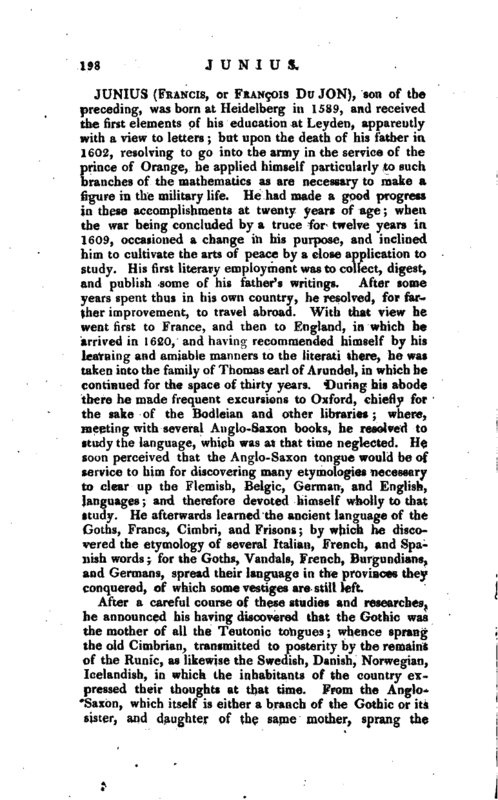 He had niade a good progress in these accomplishments at twenty years of age; when the war being concluded by a truce for twelve years in 1609, occasioned a change in his purpose, and inclined him to cultivate the arts of peace by a close application to study. His first literary employment was to collect, digest, and publish some of his father’s writings. After some years spent thus in his own country, he resolved, for farther improvement, to travel abroad. With that view he went first to France, and then to England, in which he arrived in 1620, and having recommended himself by his learning and amiable manners to the literati there, he was taken into the family of Thomas earl of Arundel, in which he continued for the space of thirty years. 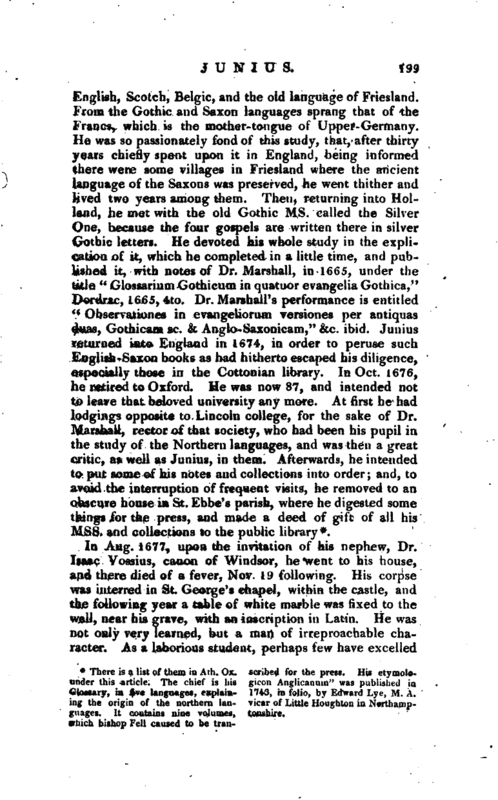 During his abode there he made frequent excursions to Oxford, chiefly for the sake of the Bodleian and other libraries; where, meeting with several Anglo-Saxon books, he resolved to study the language, which was at that time neglected. 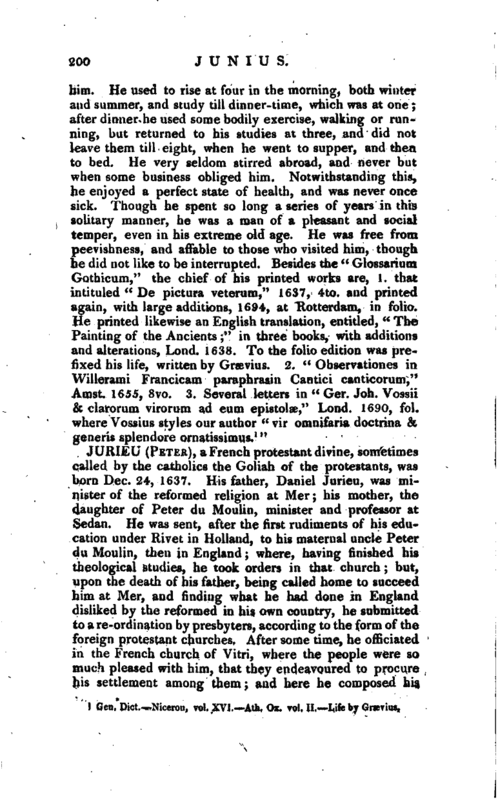 He soon perceived that the Anglo-Saxon tongue would be of service to him for discovering many etymologies necessary to clear up the Flemish, Belgic, German, and English, languages; and therefore devoted himself wholly to that study, He afterwards learned the ancient language of the Goths, Francs, Cimbri, and Prisons; by which he discovered the etymology of several Italian, French, and Spanish words; for the Goths, Vandals, French, Burgundians, and Germans, spread their language in the provinces they conquered, of which some vestiges are still left. There is a list of them in —Ath. Ox. under this article. The chief is Lis Glossary, in five languages, explaining the origin of the northern languages. It contains nine volumes, which bishop Fell caused to be tran scribed for the press. His etymologicon Anglicanuin" was published in 1743, in folio, by Edward Lye, M. A. vicar of Little Houghton in Northamptonshire.